My last summer on Channel Four will be emotional to watch but I will watch it. I know it will be difficult, as like many people, I have watched someone die from a terminal illness. However, I will watch it as I think it is important to talk about dying and , bereavement. My packet of tissues will be on the sofa with me. I have found from personal experience and my work with clients that one of hardest aspects of handling grief is that you are rarely allowed to talk about the dead person. People find it uncomfortable. It feels like a taboo subject and you can often become isolated in your grief. It is almost as though the dead person did not exist and you are expected to get on with your life. However, this is not the case. When someone dies your relationship with them does not stop. 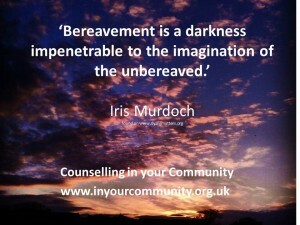 Bereavement is a personal experience and a painful journey. One of the acceptances of losing a loved one is being allowed to talk about the dead person and find a way of coming to terms with the loss. When I was in my early twenties I experienced a sudden bereavement and it was just before I started my journey as an aid worker. Within five months after the loss I was in Cameroon with peers who did not understand my days of feeling sad and were often uncomfortable of me talking about my recent loss. One day sticks out in my mind on when I felt very low and I did go to work that day. One of the locals came to me and asked me why I was sad. I told him. He listened. It was the first time anyone had allowed me to talk about my bereavement. He started talking about the year of mourning and how the Cameroon’s supported each other through death. He then took me to his hut and suggested we talk to the spirits. I was sceptical of this but I had a strong urge to talk to the dead person in my head. He poured spirit on the ground and we said a prayer. The sense of relief of being allowed to cry was immense. From that day forward I started a written dialogue with the dead person. As it had been a sudden loss, there was so much to say. Writing became my therapeutic way of coping at that time. If other cultures can talk about death, and even celebrate it, I cannot understand why we cannot. It is true that often being left behind is the hardest part but we cannot escape from the fact that we will all die. I am thankful to the five individuals who are going to give us an insight into dying and I hope it will encourage more people to talk about death. Dying with dignity is important. Dying matters is an important charity as they raise awareness of dying, death and bereavement. They are helping us as a society to talk more about death and not leave it too late to dealing with our own deaths and for us all to die with dignity. Their work includes putting death on the national curriculum at schools, which I applaud. I think the programme will challenge most people’s view on dying. What are your views, will you watch it? Feel free to share your thoughts on the programme below. Hazel provides counselling in Sheffield and online. She specialises in bereavement and loss counselling.